As the assault progressed R.N. Commandos also ensured the safe embarkation of wounded and prisoners of war. R.N. Commandos were a constituent element of the combined navy, army and air force group known as the 'Beach Brick'. The 9 th Beach Brick established its headquarters in Ver-sur-Mer in a building known as Gold Inn. As Allied Naval Commander, Expeditionary Force from October 1943, Admiral Sir Bertram Ramsay was responsible for Operation 'Neptune', the naval contribution to the invasion of Normandy, and the greatest amphibious operation in history. Ramsay initially established his headquarters in Arromanches but then moved them to a house in Ver-sur-Mer. Women of the Women's Royal Naval Service performed administrative and communication functions within the headquarters. Support vehicles include motorcycles and a 15cwt truck. The Historical Maritime Society portrays all aspects of the R.N. 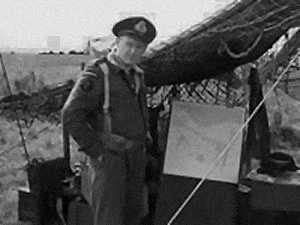 Commando operation , and the communication aspects of Ramsay's staff. WRNS operate a telephone switchboard passing messages with naval officers in logistical support.